A war veteran and his family are suing San Diego County for taking their children away for one year, because the father used medically prescribed marijuana. According to the San Diego Courthouse News Service, the lawsuit charges the County, seven of its officers, the City of Coronado and two police officers with civil rights violations, false imprisonment, battery and negligence. Child custody disputes range from mild disagreements over the frequency of visitation to more serious matters such as the case referenced here. No matter what the dispute, parents confronting child custody issues are encouraged to contact an experienced family law attorney to help protect and preserve their rights. The war veteran, Michael Lewis, was exposed to chemical weapons that caused him to suffer “debilitating” migraines. A physician gave him a medical marijuana recommendation to alleviate the pressure associated with his headaches. While Lewis kept the marijuana at home, he says that the children were never exposed to it or the smoke. But the local Coronado police were anonymously informed that Lewis and his wife were not only running a day care at their home but also were smoking pot around the children. When the police arrived at the home, Lewis let them in to see that there was no day care center on the premises. The police did, however, find marijuana. According to the lawsuit, Lewis had a medical marijuana recommendation for the pot and showed it to the officers. While neither Lewis nor his wife was prosecuted for having the marijuana, two officers arrived a few days later with agents from the Health and Human Services Agency. They took the children (ages 4 and 2) from the home and brought them to an emergency shelter for allegedly abused and neglected children. At some point during the proceedings, the juvenile court made the children “wards of the court” and placed them in a foster home. One year after they were taken from their family, the children were permitted to return home. The parents’ complaint alleges that San Diego County (and the other defendants) deprived their children of “regular, open, and free contact and companionship of family and friends…” The complaint further alleges that the officers lied to the court by claiming that Lewis was a substance abuser and a threat to his children. They are seeking punitive damages. In California, if someone makes an official claim about the safety of your child, the police or a social worker is obligated to investigate the matter. They have to determine whether the court should get involved to ensure that your child would be safe and protected. In this case, the parents are claiming that the officers and HHS agents took their children away despite their assertions that the marijuana was medically recommended and that the children were never exposed to it. This is a terribly upsetting child custody case. And while the dispute was not between the parents, which is typically the case, there was still a serious matter involving the courts and the local state agencies. If you are ever facing a child custody dispute of any sort, it is important to reach out to an experienced attorney to who will work to achieve the best possible outcome for your family. Roy M. Doppelt is a knowledgeable family law attorney with more than 20 years of experience representing parents in child custody matters. Doppelt and Forney, APLC serves clients in Linda Vista, Encinitas, Scripps Ranch, San Diego, and throughout Southern California. 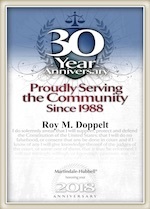 For a free consultation with a dedicated family lawyer, contact Doppelt and Forney, APLC through the law firm’s website or give us a call toll-free at (800) ROY IS IT (769-4748).